Make your summer dreams come true and connect your spa and recreative stay or holiday for convalescence in the summer with bathing fun like you can only experience it in Bad Hofgastein. For the smart village in the middle of the Gasteinertal now pipes the warm water from its thermal springs also into two marvellous thermal swimming lakes. Enjoy the sun, relax on the sunbathing lawn and spend a summer day just like in a picture book. Even your children will be excited. The lakes are a part of the Alpentherme Bad Hofgastein. The larger lake has 1,300 m2 and belongs to the thermal bath’s Relax World, the smaller lake with approx. 400 m2 are reserved for the visitors of the sauna area. Both contain only 27 degree thermal water - this is thermal spa feeling against the natural backdrop, bathing fun in a totally different way! By the way: The both thermal swimming lakes are only cleaned using organic methods. Here you will swim in water that stays fresh and clean, entirely without chemical additives - a pure blessing for people with sensitive skin or skin problems. It goes without saying that you as our guest in the Thermenappartements will enjoy unlimited and free entry to the two swimming lakes of the Alpentherme Gastein. After all the Thermenappartements are a premium partner of the thermal bath. Through the underground passage you will get from your apartment to the Alpentherme Gastein in no time and find yourself in the centre of the summery action - entirely casually and comfortably in your swimwear. 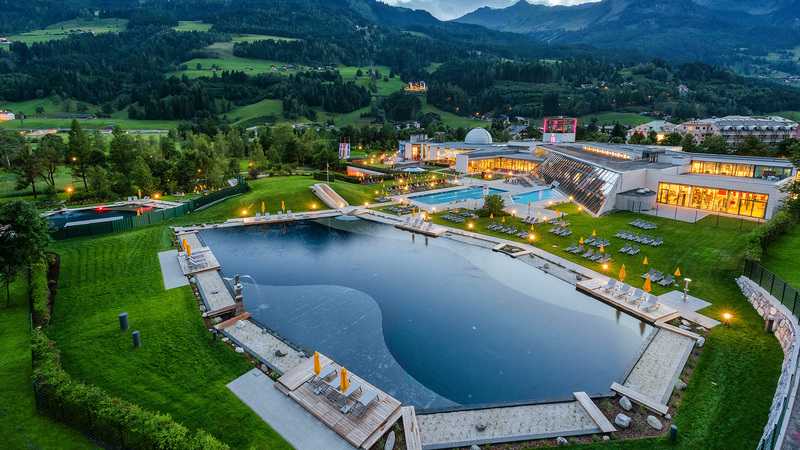 The thermal swimming lakes in the Alpentherme Bad Hofgastein are the icing on the cake in your summery wellness holidays - come and take the plunge! The team of the Thermenappartements in the Gasteinertal will happily answer all of your questions and warmly welcome you as their guest!